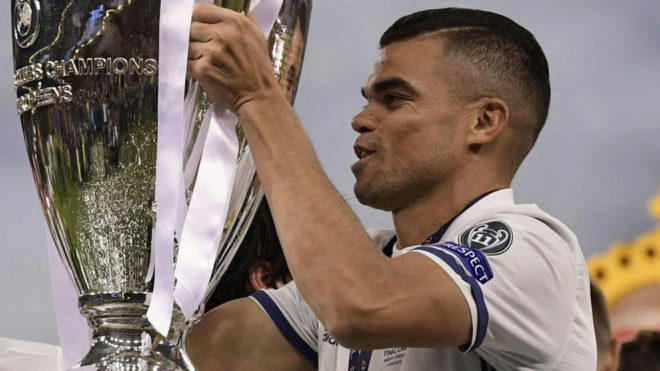 Updated 06/06/2017 09:50 CEST Whilst Real Madrid still bask in the glory of winning a 12th European Cup, Pepe has slipped out of the back door of the Estadio Santiago Bernabeu, clearly unhappy at his recent treatment from coach Zinedine Zidane. Though the player accepts the decision to only offer him a one-year extension is a professional one, Pepe still doesn’t understand how his coach and his club knew he was leaving before he did. “I did not say goodbye to Zidane because he and Real Madrid knew I was going before me,” the Portuguese said to the ‘El Partidazo’ programme on Cadena Cope. “I do not want to blame anyone, what Zidane has done with Real Madrid is spectacular, but there are things I do not understand. Inter were touted as a possible destination and then Paris Saint-Germain, but it could be elsewhere that Pepe continues his career. “Real Madrid did not offer me a two season renewal, just one year,” he continued. “One stage is over and, from now on, another new one will start. An issue with the Treasury could be partly to blame for Pepe’s departure. “The club has not defended me with the Treasury issue,” he said. “You know that I have everything up to date but have you seen the club defend me? In leaving, the centre-back was at least satisfied with his application whilst at Los Blancos. “I have given the maximum,” he noted. “My blood and my sweat for Real Madrid.